The Fellowship, now in its fifth year, is a prestigious year-long cohort that accelerates the development of the top 18 to 30-year-old entrepreneurs in the nation. The goal of the program is to develop both the founders and their businesses, giving them the greatest foundation for future success. Fellows benefit from mentoring, entrepreneurship retreats, a peer community, and volunteer opportunities through Future Founders programs. See all current and alumni Fellowship companies here. The Fellowship is generously supported by Motorola Solutions Foundation (organizational founding sponsor), Capital One, The Coleman Foundation, The John E. & Jeanne T. Hughes Foundation, Keywell Foundation, EY, and Jack and Goldie Wolfe Miller Fund. 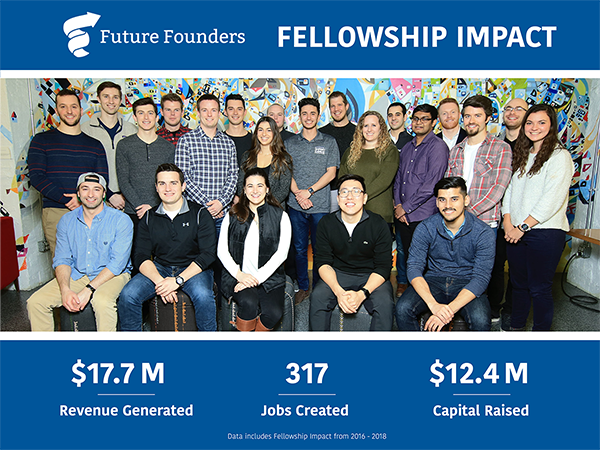 For more information or to nominate yourself or a collegiate entrepreneur for the Fellowship, visit here or contact Katie Sowa, COO, at katie@futurefounders.com. To sponsor the Fellowship, contact Scott Issen at scott@futurefounders.com. Note: This data was compiled from a February 2019 study of Future Founders Fellowship companies.